It is said that you have not seen all of India if you have not been to Rajasthan. The north western state upholds the true essence of India with its vibrant culture, touch of royalty and diverse wildlife. Find more information about national parks and sanctuaries in Rajasthan.Although deserts are a major part of Rajasthan, it is not all of it. The rich flora and fauna of the largest state in India is widely appreciated, which makes it a huge favorite with travelers around the world. With lots of protected areas in the form of national parks and sanctuaries in Rajasthan is a safe haven for rich wildlife of varied species. The Ranthambore National Park is famous for tigers, in spite of the fact that the forest cover in Rajasthan is less than that of other states. The largest of the cat species can offer awe-inspiring views to tourists who travel to Rajasthan from all over the world. The wild life lovers are bound to be thrilled with the safari rides and a Tiger Tour can definitely be worth remembering. Explicit areas are covered in exotic species of flora as well, which makes for a great show amidst the lush greeneries in Ranthambore. 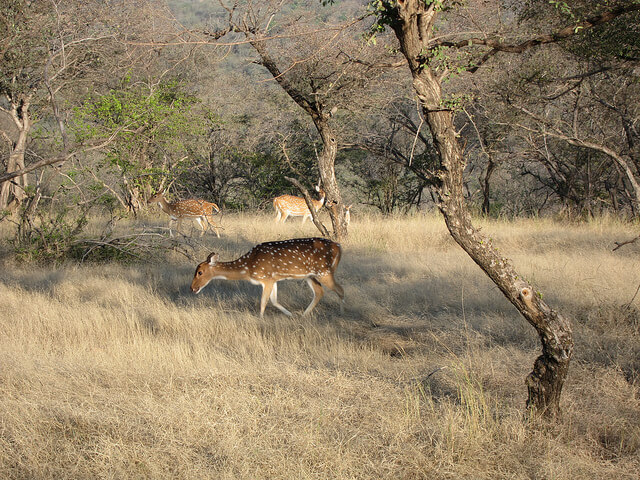 Apart from the tigers, the National Park is also home to other wild species including leopard, wild boar, hyena, nilgai and deers like sambar and chital. Apart from Ranthambore, the Sariska National Park in Rajasthan is popular with the bird watchers, especially due to the abundance of Indian Peafowl. The Koladeo Ghana National Park is a UNESCO World Heritage Site and is regarded as one of the most famous bird sanctuaries in the world. The Desert National Park, near Jaisalmer, can leave a visitor astounded with its vast sandy habitat presenting the ecosystem of the Thar Desert in true variations. From the famous blackbuck antelope, desert foxes, wolves and desert cats, the national park can also reveal spectacular birdlife of the desert regions to visitors who go on a trip to Rajasthan. Exploring the protected area can be a delight for the birdwatchers as they can experience the sandgrouse, partridges, larks, bee-eaters, shrikes and other migratory birds like the Demoiselle cranes and houbara. The tawny eagles, the honey buzzards, falcons and kestrel make for a great show too, as birds of prey. Whether it is summer or winter, thenational parks and sanctuaries in Rajasthan thus calls for a visit at any time of the year, owing to the presence of extensive species that can be a nature lover’s paradise. With lots of protected areas in the form of national parks and sanctuaries in Rajasthan, it is a safe haven for wildlife of varied species.